Really like this - the processing is perfect! love the composition! Beautiful work with textures. Looks awesome. Love the composition and the textures! great photo, I too love taking shots of hotel signs and signs in general! That vintage look is wonderful. Thinking about you this weekend. Hope you are spared the wrath of Irene. Wonderful. I agree that it is perfect. 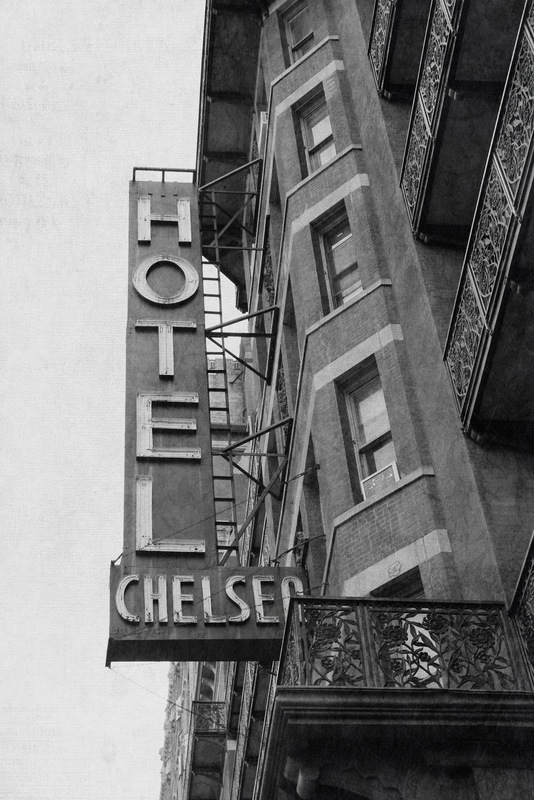 I just finished reading "Just Kids" by Patti Smith and this captures her descriptions of the Chelsea Hotel and that time. You caught a perfect POV and the textures give this a lovely vintage feel. Will have to try some textures with black and white. Stay safe this weekend. Perfect image for these edits. Nicely done! Hope things keep as well as they can in NYC this weekend...wonderful image! I love old signage... and you've captured this scene masterfully! Too nice! As everyone has said, I hope things remain as calm as possible this weekend... stay safe, U.M.! Great processing on this one. You are really turning out some beauties! Hope Irene is kind to you. a wonderful timeless quality to this shot, love it! I love pictures of signs and always will. This is great. Glad to hear you made it through the storm ok.